Posture and balance problems sometimes may force you to look for assistance in walking. Walking canes can provide such assistance. In other instances, walking canes are handy fashion and self-defense accessories. The need for walking cane notwithstanding, you need to find the best the market has to offer. This equipment comes in many shapes, types, and sizes. So, how do you choose a good cane? First, you need to know what constitutes a good walking cane. Broadly, it should be stylish, comfortable, strong, functional and personally secure. High-quality brands have other features and specifications that make them stand out. To start you off, we present you with reviews of the top 5 walking canes currently in the market. Top 5 Best Walking Canes Worth Investing: Zap Zapcane Cane. ZAP ZAPCANE Cane is equipped with 1 million volt stun gun for self-defense while an ultra-bright LED (30 lumens) flashlight ensures you miss nothing in the cover of darkness. A built-in rechargeable Ni-MH battery powers the flashlight and the stun gun. Each charge cycle of the battery can last up to 90 days and give you the ability to shock for up to 500 times with the stun gun. With the cane’s adjustable length of 32 to 36 inches, you can find the right size for you. The ZAP Cane is also armed with a comfortable rubber handle grip and extra rubber tip. Its maximum carrying capacity is 250 pounds. The package includes a nylon case and a wall charger. Midway along the shaft of the cane is a removable reflective safety band to ensure you are noticed from several meters away. All the controls are on the handle, which improves convenience. Comfortable rubber handle grip ensures extended use without fatigue. Adjustable lengths are great because you do not have to go for a specific size. The bright LED flashlight and powerful stun gun are great for self-defense. Visible electrodes are unsightly and take away the element of surprise for defensive purposes. Designed specifically for men, the Harvy folding cane is ultra-lightweight measuring just 8 ounces for easy handling and portability. Despite the small size, the walking cane can handle up to 300 pounds carrying weight. It features four parts that are foldable for easy portability. The cane can adjust from 33 inches to 37 inches meaning you will not have to spend your time looking for the specific size for you. 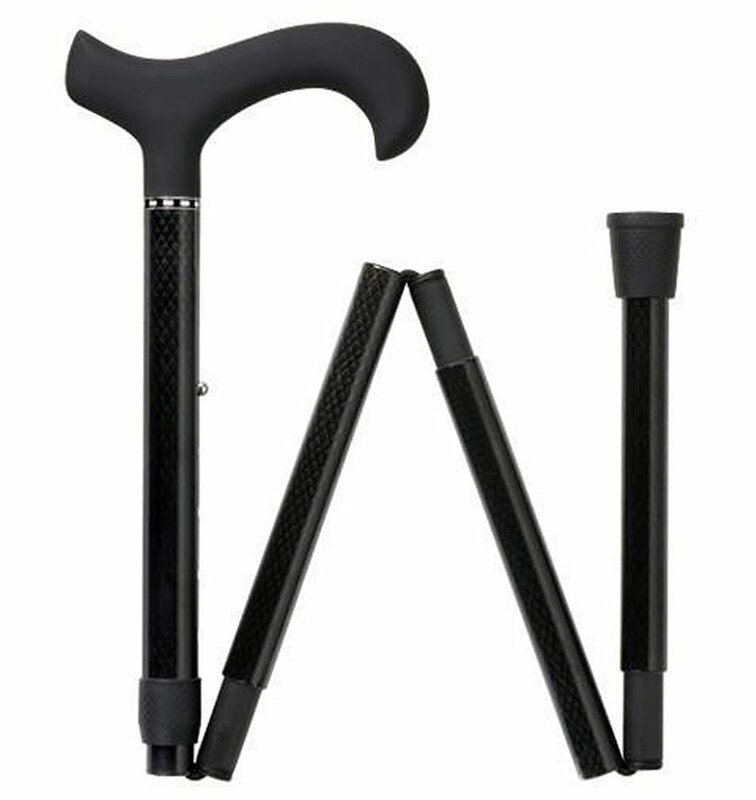 Harvy Men’s walking cane is made of carbon fiber, one of the strongest and most durable materials for cane construction. Furthermore, carbon fiber has high tensile strength, high stiffness, lightweight, chemical resistance, heat resistance, and feature low thermal expansion. The cane also has a soft touch handle made of rubber for handling comfort. The handle also fits ergonomically into your hands to reduce fatigue even after extensive use. It comes with a carrying case. Carbon fiber construction makes it very strong and durable. It is adjustable meaning you do not have to worry about going for a specific size. It lacks other useful features such as a flashlight and reflective safety band. It is a little bit pricey compared to others in its category. 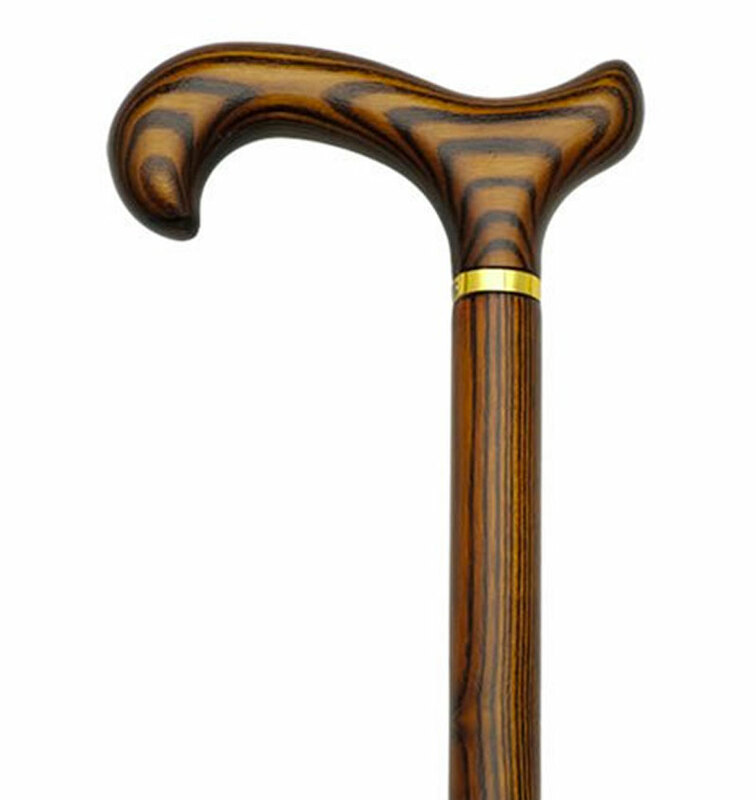 Check the price of the Harvy Men’s walking cane. A great but affordable gift item you could find for your loved one is the Unisex Derby Cane. It features a unique chestnut shaft in natural finish, which looks elegant. It has a fixed measurement of 36 inches, which is compatible with the height of most people. Harvy designed this walking cane specifically as a fashion accessory, and therefore it is not meant to bear weight. However, it can still give you minimal support. Derby handle is elegantly crafted to provide comfortable and ergonomic support while the steel reinforced suction grip rubber tip and combi spike tip ensure the cane grips the ground strongly for stability. Since the cane is made of natural wood, it is very light. The original cane measures 36 inches, but you can cut 2 inches off without affecting the pattern of the wood. Wood construction makes Derby light. The wood is not very strong and therefore can give a way of weight is applied. Check the price of the Unisex Derby Cane. 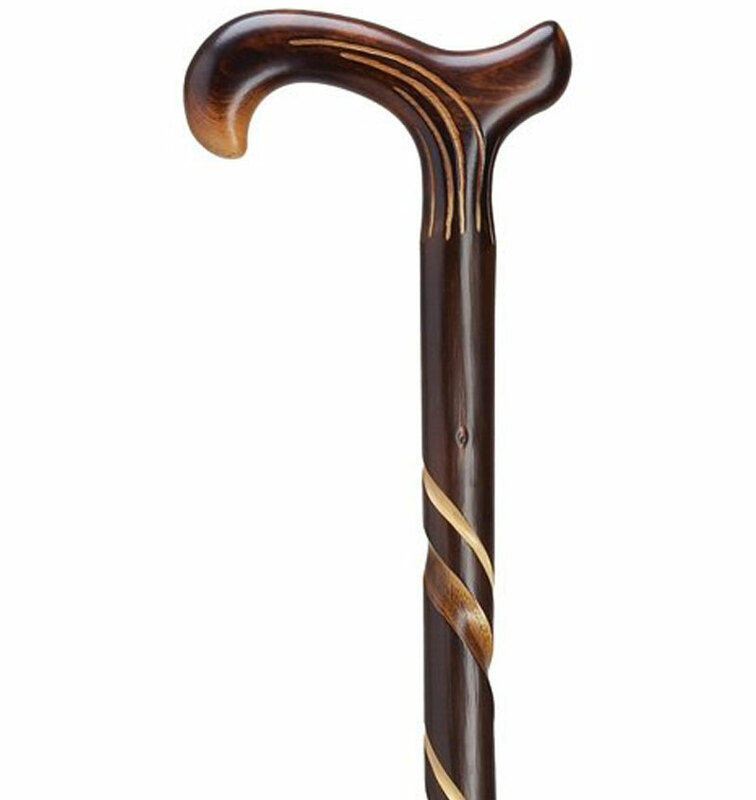 Men Derby cane presents an elegant ash shaft in scorched and cherry stained finish that is 36 inches long. This single point cane has a weight capacity of 250 pounds for men weight this and below. Its elegant wood construction makes it lightweight and beautiful, a perfect gift item for a loved one. Although it comes with a fixed height of 36 inches, you can cut the wood from the tip without interfering with the pattern of the ash wood shaft. Derby’s zebra handle looks great but is also designed to offer comfort. The shaft has a small brass band at its neck adding to its beauty. It has a rubber tip for uniform weight distribution and stability during use. The cane is very light measuring just 0.7 pounds making it very portable and easy to handle. Zebra handle is beautiful and comfortable. It is both a fashion accessory as well as the assistive cane. Derby is made of pure wood which may break due to weight. The cane gets narrow towards the bottom pit which may make it flimsy. 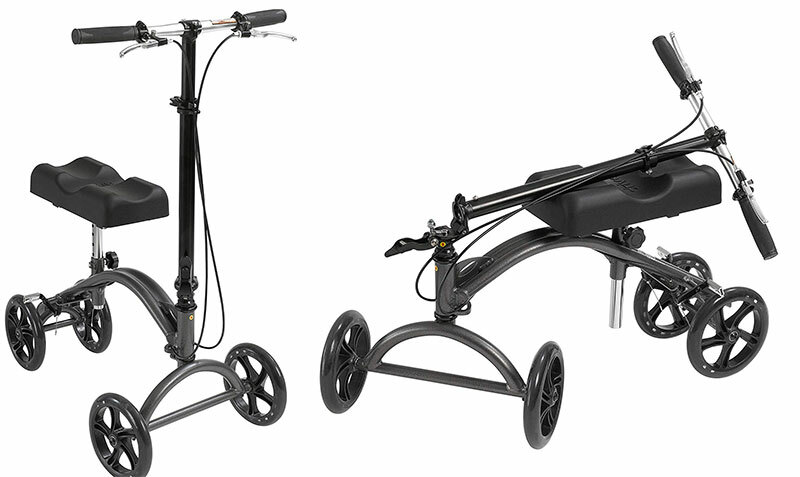 This height adjustable quad cane is designed to accommodate most people with heights of between 5’ to 6’5” with a maximum weight capacity of 300 pounds. This walking cane has a shock absorbing cushion-top handle with reflective strap for your night safety. The design incorporates push buttons to offer eleven precision height settings. The handle adjustments range from 2’4” to 3’3” (handle to the floor). Hugo Quad Cane has an ergonomic handle engineered to fit more comfortably in your left or right hand while its K-shaped base provides better stability. The base also allows rotation to make it possible for left or right-hand use. The cane’s construction material is heavy-duty anodized aluminum for durability and lower weight. It is stylish, durable and versatile. 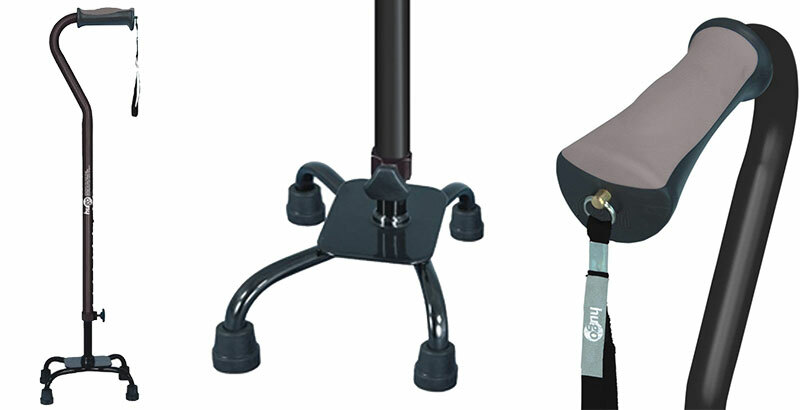 It is stable and strong thanks to its small base quad canes. The cane allows for either left or right-hand use. At 2.1 pounds, this walking cane is heavier than many other brands. The quad cane may become wobbly with time. The cane does not fold, and this makes it less portable.